I his large toucan inhabits tall rain forest and forest edges, usually staying in the higher branches antl foliage canopy of mature trees. Like other toucans, it roosts by squatting with its head turned backward, resting its bill on its back, with the tail turned forward and resting on the bill. It usually lives singly or in pairs, but at times it may gather in larger groups since five birds have been reported roosting huddled together on a branch. Seen in flight it appears top-heavy with its large bill; it makes a few quick wingflaps, then glitles along on set wings. Red-billed Toucans feed on fruit, tree catkins, insects, spiders, other animals such as lizards, snakes, and eggs and nestlings of small birds. The call is a loud series of rhythmic yelps, often accompanied by upward jerks of the bill and tail. 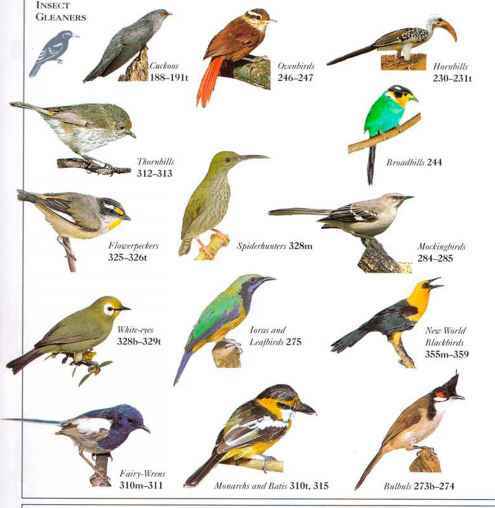 • NEST A natural cavity in a tree, sometimes lined unintentionally with regurgitated fruit stones. • DISTR1BIJTION N. Amazonia from E. Colombia and E. Venezuela to the Guianas and N. Brazil. I he huge, unwieldy bill of this toucan gives the bird an unbalanced look, but the bill is light and hollow in structure. It is very conspicuous when the bird is seen in flight, which is undulating, with alternating flaps and glides. The w hite rump and red undertail coverts arc also noticeable in flight. 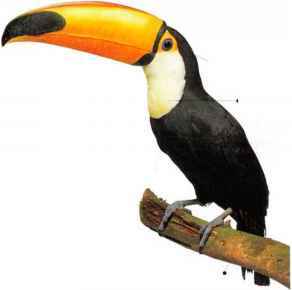 The Toco Toucan lives in woodland, secondary forest (areas where the trees have regrown after forest clearance), and coconut and other palm plantations. 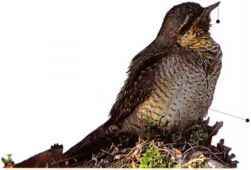 It is seen moving along branches with heavy, bounding hops, taking mainly fruit and insects, but also other small creatures and the eggs and nestlings of small birds. The large bill enables the bird to reach food on the end of thin twigs that cannot support its weight. Food is seized in the bill tip and the head is tossed back, opening the bill. This throws ¿¡^^ the food to the back of the throat where the long, bristly tongue may help catch it. Toco Toucans utter deep, croaking calls in a deliberate manner, often from a high twig. • DISTRIBUTION From Venezuela south distribution through Brazil to N.W. Argentina.